Study: What are the unique gifts that God has given me? How might I be called to share my life with others? Pray: Ask the Lord for the guidance and direction you need. Serve: What needs are before you right now? How can you help another with your life? 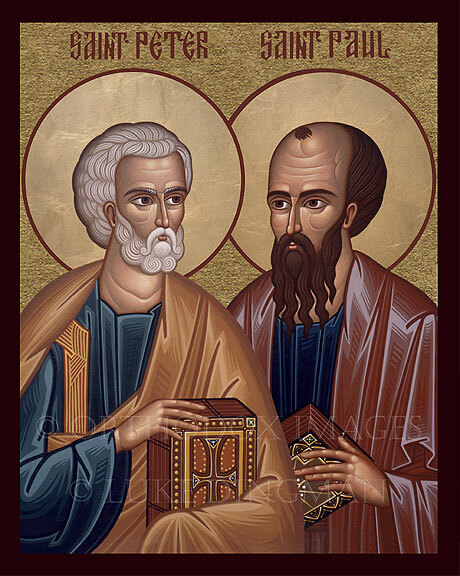 Every year on June 29th the Church celebrates two of its greatest figures – Saint Peter and Saint Paul. 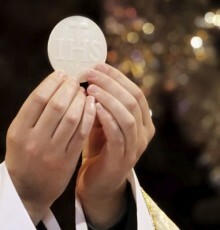 Since this feast falls on a Sunday, we transfer the readings and prayers of this feast to all the weekend masses. When you think about the influence that these saints have had through their leadership, writing, and example it is easy to see why the Church chooses a day to honor their memory. Their lives are part of the very foundation of our faith; they were human instruments by which God was able to share the Good News of Jesus Christ. Saint Peter, for all his human weaknesses and failings, offered his leadership for the early Church. The very fact that he made mistakes, spoke out of misunderstanding, and sometimes let fear and doubt cloud his judgment is the very reason why many people respect him. Rather than get frustrated or dejected, he kept getting up and following Christ. Saint Paul, who formerly persecuted the Church, would become its greatest advocate through his immense number of letters, exhortations, and journeys. At times misunderstood or openly attacked, he continued to proclaim the message of Christ. Life was not easy for these men! They were physically tortured, imprisoned, falsely accused, mocked, ridiculed, beaten, and at times abandoned. They gave up their families, their careers, the stability of their lives – ALL FOR THE LOVE OF CHRIST. In the end, this immense personal sacrifice would culminate with the greatest of all offerings: they would give their lives for their faith. Peter would be crucified upside down (stating that he was unworthy to die in the same way as his Lord). Paul would be beheaded. Their deaths both took place in Rome, where they spent the last days of their lives, teaching and preaching in the name of Jesus. These men were some of the very foundation stones of our faith. Upon the example of their lives we have built our Church. We are their living legacy; their example inspires us. Yet they also remind us of our obligation to the next generation. Just as Peter and Paul shared their faith, so too we are called to do the same. We have the opportunity to continue their work, and thus be an example to future Christians of the love and faith that comes from Jesus Christ. Study: When in your life have you experienced love without words? How did you know that you were loved even when nothing was said? Pray: Ask the Lord for guidance – who am I called to love today? How am I called to love? Serve: What random act of kindness can I offer today for another? How can I let the Love of Christ shine through my efforts? In my travels I have found myself on occasion in the company of people who did not speak English. Indeed, when I would try my limited Spanish or Italian (or even my Latin! ), I found that we had no common foundation upon which to communicate. I wanted to share my thoughts, but I did not possess the medium to make it happen. As I was explaining this frustration to one of my professors, he shared with me a common language that affects us all. 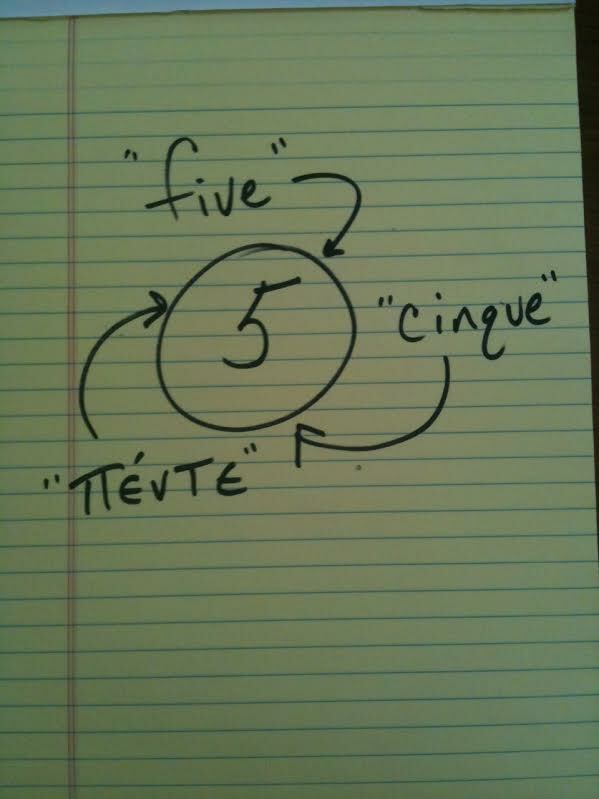 It is a language that all of us can understand even though we use different words to explain it. The language? Mathematics. You get the idea. The number means the same, but is spoken in a different way in each language. Through time and space God has come to humanity in many different ways. God has communicated to us through different instruments (Prophets, Dreams, Visions, Saints, Nature…), and God has spoken in many different languages (Jesus spoke Aramaic, the New Testament is written in Greek, St. Augustine wrote in Latin…). Yet God uses one word again and again among us – LOVE. Indeed, we are told that God is love (1 John 4:8). This love is seen most clearly in the mystery of the Trinity, where God comes to us in love to teach us how to love one another. God the Father created us in love. God the Son redeemed us out of love by his death and resurrection. God the Holy Spirit sustains us in our lives to put this love into practice. Jesus speaks of the love of the Father (John 15:9), and the Lord tells the disciples that out of love he will ask the Father to send the Spirit (John 14:16). Love is the reason God made us, God saved us, and God strengthens us today. If love is the language God shares with us, then we are invited to speak this language in our lives. Our call as Christians is to proclaim in our words and actions the love of God – Father, Son, and Holy Spirit. For if our love is sincere, then it will communicate in a language that breaks all boundaries. Study: Where in my life have I experienced God’s grace and strength? Pray: What particular needs in my life call for the help of the Holy Spirit? Serve: Where can I use the gifts God has given me to serve another right now? In other words, the Holy Spirit unites people, renews life, provides unique gifts, and is granted to the Church by Christ. This is the day that the disciples were empowered to continue the mission of Jesus; filled with the Spirit they will witness the Good News of the Lord through their words and actions. Their example becomes our model. The same Spirit that changed their lives comes to us. The same Spirit that gave them the grace and strength to go forth gives us the power we need to offer our lives for Christ. God continues to invite us to serve, and the Lord pours forth the Holy Spirit to help us carry out the work of this day. Are there barriers in our life? 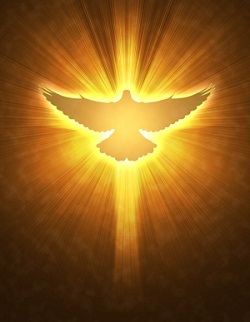 Come Holy Spirit! Are there parts of life in need of renewal? Come Holy Spirit! Are there gifts we have that need to be used and directed? Come Holy Spirit! Jesus freely gave the gift of the Spirit to his disciples – may we turn to the Lord with conviction that as we call for the Holy Spirit in our lives we will be given what we need for the work of this day.